Bits or pieces? : AWS and Gross Margin. AWS has now reported and there is a lot of noise over margins including ample confusion over operating margin vs gross margin. A couple of things to begin with. 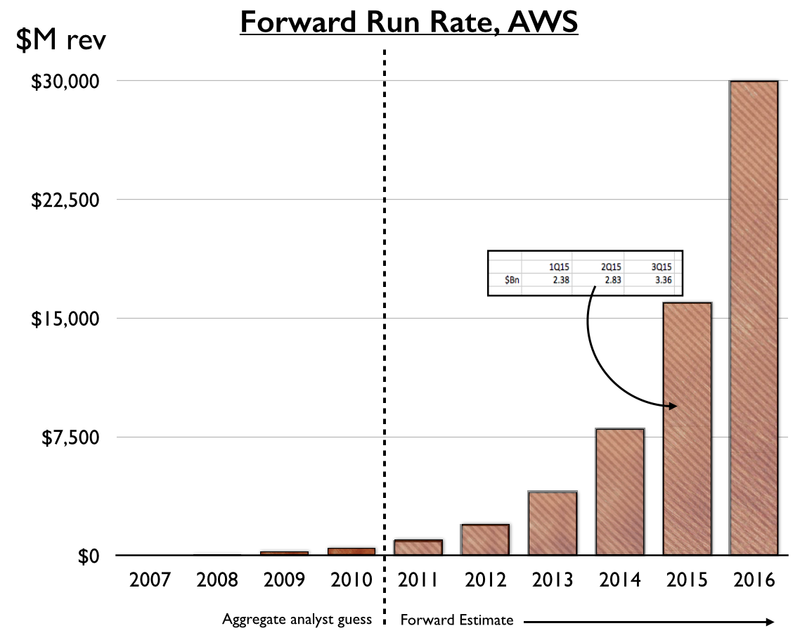 Back in my Canonical days I plotted a forward run rate for revenue of AWS. This was based upon lots of horrendous assumptions and to be honest, I'm more interested in the direction of travel rather than the actual figures. A copy of the output of that model is provided in figure 1. Figure 1 - forward rate. Now, what the model says is that after 2014, the revenue for AWS should exceed $8Bn in each subsequent year. After 2015, the revenue for AWS should exceed $16Bn in each subsequent year and so forth. Don't ask me what the actual revenue will be - I don't care. I'm more interested in the speed of change of the punctuated equilibrium that is occurring. A couple of things to note. Compute is price elastic (it has been for 30 odd years). What this means is that as prices drop then volume increases. Today, I can buy a million times more compute than I could in the 1980s for $1,000. This doesn't mean my IT budget has reduced a million fold in that time, quite the opposite. What has happened is I've ended up doing vastly more stuff. This is the thing about dropping prices in a price elastic market, demand goes up. But if you're already doubling in physical size (or as AMZN has stated increasing 90% per year in capacity) due to a punctuated equilibrium and a shift from one model of products to utility services then you have to be very careful of constraints. For infrastructure there is a constraint - the time, material and land required to build a data centre. What this means is that it is highly likely that Amazon has to carefully manage price reductions. It would be easy to drop prices causing an increase in demand beyond the ability of Amazon to supply. This 'weakness' was the one I told HP / Dell & IBM to exploit back in 2008 in order to fragment the market. They didn't - silly sods. However, over time the market will level to a more manageable pace of change i.e. the ravages of the punctuated equilibrium will have passed and we're down to good old price elasticity and operational efficiency. It is really useful therefore to get an idea of how much prices can reduce by. The reason for this is rather simple. Cloud is not about saving money - never was. It's about doing more stuff with exactly the same amount of money. That can cause a real headache in competition. For example, let us say your company has an annual revenue of $10 Bn and spends around 1% of its revenue on infrastructure, platforms and related technology - say $100M p.a. Now, what matters is the efficiency delta between your provision and utility services like AWS. Many people claim they can be price equivalent to AWS for infrastructure but often I find that the majority of the costs (e.g. power, air conditioning & other services, building, cost of money, maintenance, space capacity) are discounted by claiming that it belongs to another budget or just ignored (in the case of capacity cost). This is why I tell companies that they really need to set up their IT services as a separate company and force it to run a P&L. Hardware and software costs usually only account for 20%-30% of the actual cost of the services 'sold'. Oh, as a hint if you're a CEO / CFO and your CIO says they're building a private cloud comparable to AWS then the first question you should ask when looking at the cost comparison is "What % of the cost is power?" If they bluster or say it's covered elsewhere then you're likely to be building a dud. Start digging into it. The other problem is that people compare to AWS prices today and ignore future pricing. The problem here is that if there is a high gross margin for AWS then as the constraints become more manageable then prices will drop to compensate and increase demand. When you look at the problem through a lens of future pricing and actual cost then in some cases you can easily reach a 20x differential. But what's the big deal? What if your competitor reduces their infrastructure, platforms and related technology costs from $100M to $5M, that's only $95M saving and what is at stake is the whole $10Bn revenue. It sounds risky? Wrong. Your competitor won't reduce their cost through efficiency, they'll do more stuff. So, they'll spend $100M p.a. but do vastly more with it. In order for you to keep up then using an "old" and inefficient model you'll need to be spending $2 Bn p.a. just to keep up. That's not going to happen. What is going to happen instead is your competitor will be able to differentiate and provide a wealth of new services faster, quicker and more cheaply than you in the market until you are forced to adapt. But by then you'll have lost MaSh and the damage will be done - not least of all because marketing & biz will be at the throats of IT more than ever. You have no choice about cloud unless you can somehow get the actual costs down to match that future pricing. Very few have the scale and capability to do this. 1) cost of providing Amazon's own estate. 2) cost / capital leases / staffing costs / depreciation for any future build - NB given AMZN is doubling in capacity each year then this will be significant. 3) SG&A costs which tend to be high when building up a business. 4) development costs for introduction of new industrialised services. Many of these operating income costs are likely to reduce as a percentage as we pass through this punctuated equilibrium (i.e. as we move towards using utility services as a norm). The speed of build up of new data centres and investment in future capacity will become more manageable (controlled by price elasticity alone). The amount spent on sales and marketing to persuade people of the benefit of cloud will reduce (we will just be using it) etc. To give an idea of what the potential future pricing might be then you need to look at gross margin i.e. revenue - cost of good sold. However, AWS doesn't give you those figures (and for good reasons). Furthermore AWS is made up of many different services - compute, storage etc - and the gross margin is likely to be very different on each of those. Now, if you simply look at the revenue changes then AWS accounts for 37% of the growth of AMZN in 1Q. By taking the operating expense items covering technology, fulfilment, marketing and SG&A and making an awful assumption that all areas of business are equal (likely to be a huge underestimation) then you get a gross margin figure of around 50% for AWS. You could get a more accurate picture by profiling the lines of business based upon past reports etc but I can't be bothered to spend more than ten minutes on this as it's not my area of interest. However, I don't think it's unreasonable to expect AWS gross margins to be north of 60% based upon this and experience. This matters because it gives you an idea of how much future pricing cuts could be and that's not even factoring in efficiency in supply, Moore's law etc. If you're looking at AWS figures and going 17% operating margin is high but there isn't too much scope for price cuts then you're brewing for a shock. Consider yourself warned and put some effort into actually analysing the figures. NB. I retired from Cloud back in 2010. Don't ask me to put any effort into detailing this more. I have bigger fish to fry and have close to zero interest in this subject. I only put this up because I keep seeing elementary mistakes being made. This stuff doesn't even cover the enormous ecosystem advantage that Amazon creates or the basic benefits of componentisation. Don't underestimate those either - you will get spanked if you're trying to compete without understanding this stuff. Pick a course, adapt as needed. What's in a Wardley (Value Chain) Map?